Adventure Game Studio | Games | Crash! Evade! Destroy! The name says it all. 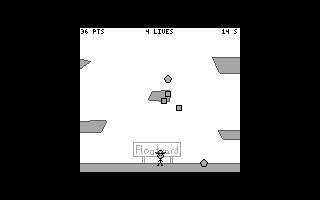 It's a platform game that has you crash into certain things, evade other things, and shoot a third group of things. It's pretty simple, but fun. Sounds and music taken from soundboy.de and vgmusic.com, respectively. "Akatosh's gameboy style game shows promise, though at the time of this review it suffers from the game objects freezing when colliding with the background." This is a DEMO version: you can download up to 0% of the game.